Just 5 km away is to Hostinne ancient art to the gallery, less than 10 km to the Young Buky the ski slope and into the area of the newly built golf course. 20 km to the famous zoo in Dvur Kralove nad Labem or Baroque Kuks. 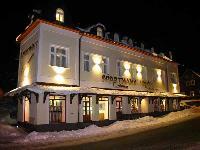 Are easily accessible from here and nearby famous resorts in town or Spindleruv Mlyn. In the village itself was recently built or restored several accommodation and restaurant facilities, which, with its amenities and quality services offset similar facilities in mountain resorts. These include in particular Pension Herman Arnika hotel, hotel or pension Zoya Bily court, in the summer months and local campsite with a swimming pool. Besides swimming, visitors can also take advantage of riding in a neighboring village or scenic flights from the airport 7 km away. The village can be a starting point for summer hiking and mobile for trips of the highest Czech mountains and sights for Giant region. In winter, the place where they are easily accessible mountain resort skiing (Cerny Dul, Young Buky, Janske Lazne, Spindleruv Mlyn, Pec pod Sněžkou), there is a network of groomed cross-country trails, and not least the new stadium in Vrchlabi with skating rink open to the public.